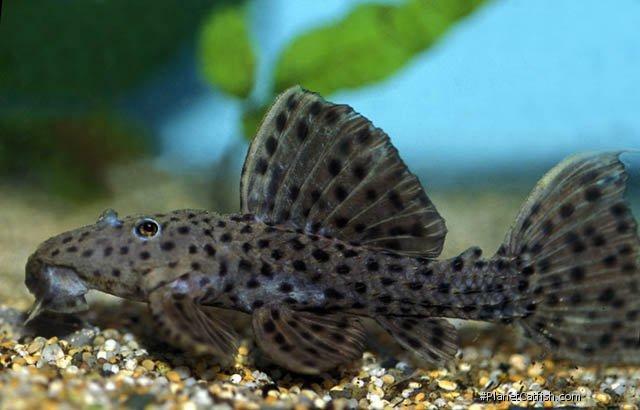 Pseudacanthicus spinosus is perhaps the most documented cactus pleco of the genus but more becuase it's been around a long time and features in some of the older aquarium catfish literature; reports of breeding are rare. 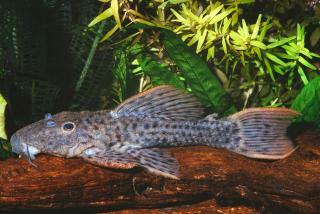 James Kitchen pretty much specialises in keeping the spiny plecos of this genus and, in his first CotM, he explains, and shows, how he came to successfully breed this species. The date of spawning was November 26, 2012 in a 180 gal(US) tank, 72” x 24” x 27” with sand substrate, live plants, wood, rocks, and caves. In terms of water, the temperature was 82°F, conductivity: 635µS with a pH of 7.5. The male was approximately 9.25” and almost four years old while the female was approximately 9.0” and, again, almost four years old. 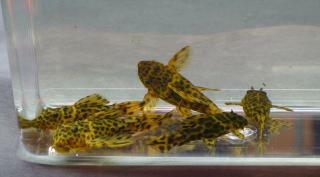 A water change was completed approximately two weeks before spawning activity started. Breeding pair of P. spinosus; male left, female right. Cave with eggs just after female left cave for last time. The pair started showing interest in the cave approximately one week before the actual event. As with other Pseudacanthicus (shortened to pseudas in this report) it is very important to situate the caves so they cannot be moved. Pseudas are very enthusiastic and have the ability to re-landscape their environment due to their size. It is also important to give them several caves to choose from, since one never knows what a fish likes. For the first day or two, the male and female will stay together in the cave noses first. The female goes in first, followed by the male. Only half of the male is in the cave. They will stay together for several hours at a time before taking a break. When the female is ready she kicks the male out of the cave, spins around, and backs into the cave tail first — this happened about 4:30pm, in the afternoon of the second day. She will then sit in the cave with only her mouth and nose by the edge of the cave. 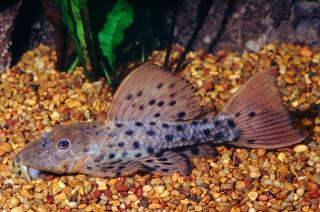 The male will then stick his head and pectoral fins into the cave with his stomach resting on the female. The female will then get agitated and again kick out the male. The male will stay outside the cave with all of his fins erect, either showing off to the female, or warning others to stay away. He then slides his body closer to the cave opening to block it. Sometimes the female will dart out and push him away only to quickly return to the cave. This display continued for over 30 minutes. During the next phase the female, still with her tail to the back of the cave, allows the male to enter the cave nose first and rest on top of her. At this point the male has half of his body in the cave. The female starts to bump the belly of the male with her head. He responds by pressing down on her and shudders. They stayed this way until about 7:00 pm. The female, with a hard push, then knocks the male out of the cave. While the male sits on his tail with his body floating a few inches off of the bottom, the female swims under him and rubs her entire body on the male’s underside. Before he can settle back to the bottom she spins around and repeats the maneuver, rubbing the male with the top of her head all the way down to her tail. After several times the male bears down on the female as she slides underneath him. Without warning, the female darts for the cave, and goes in tail first, followed very quickly by the male. With the female on one side of the cave and on the bottom, the male squeezed into the other side all the way to his pelvic fins. The male begins to push down on the female in a slow rhythm. After a time the male will shudder and then curl his pelvic fins under his body and push water into the cave. My guess is that he is fertilizing the eggs as the female is depositing them. At 10:00pm I watched the female dart out of the cave and the male began to guard the cave and fan the newly deposited eggs. It is my personal preference to let the male take care of the eggs until they start to hatch out. The natural way is far less work and the fry are more robust. The eggs take about seven days to hatch and 11 days later they are free swimming. It is advisable to collect the fry about 7 days after they hatch. Otherwise they escape from the cave into the tank, greatly reducing their chances of survival. 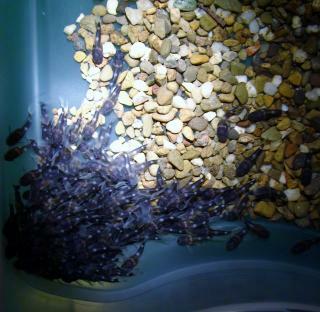 There are about 200 eggs per spawn and the fry are 17mm when they are free swimming. Feeding is straightforward as they can chew Thera A for their first meal. Pseudacanthicus spinosus fry at 16 days. Pseudacanthicus spinosus fry at 10 months.